Helen Feeney feared the kitten was dead. The tiny animal lay on a plastic bag of rocks near a busy street in Bukit Lawang, Indonesia. 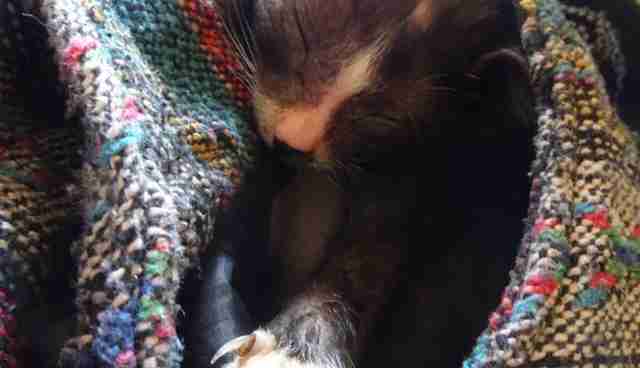 The kitten's eyes were clamped shut, her body completely still. Feeney sucked in a breath, and reached a hand out. As soon as Feeney made contact with the kitten's filthy fur, the kitten started to purr. Still alive! Feeney scooped the kitten up and sat with her on a chair at a nearby restaurant. But what could she do? 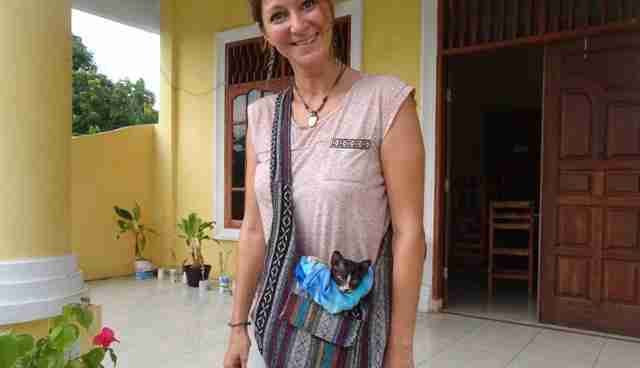 Feeney was only in Indonesia on a short visit from the U.K., and she couldn't exactly take the kitten with her. 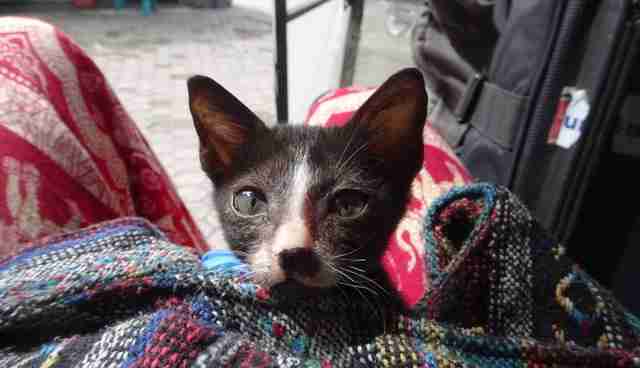 The restaurant where Feeney sat was closed for Ramadan, a Muslim holiday celebrated in Indonesia, but Feeney wanted to feed the kitten. She went to a nearby shop and bought the best kitten-appropriate food she could find in the small town, which was an egg and a tin of sweetened milk. She borrowed a bowl from the restaurant and fed the kitten on her lap. "She was like a bag of bones," Feeney tells The Dodo, "so weak and helpless." 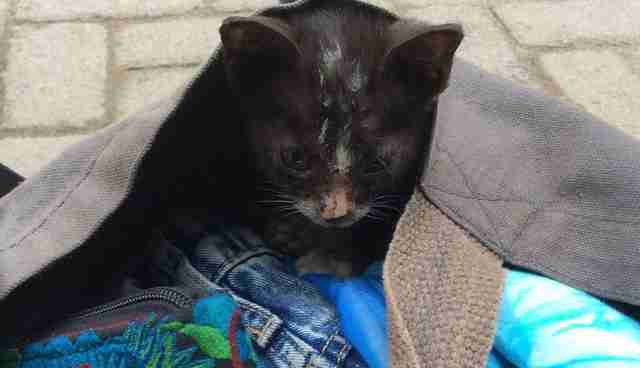 Now Feeney faced a tough decision - leave the kitten here, or find a way to help more? 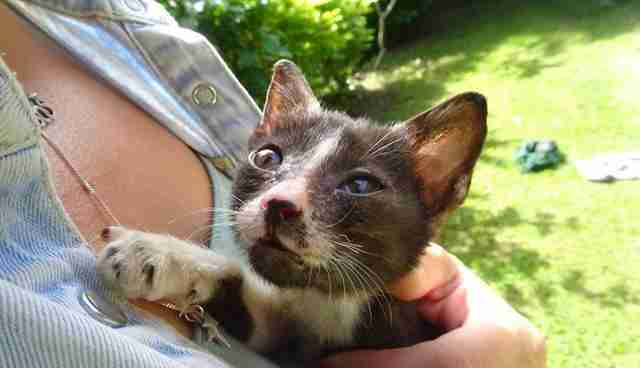 This wasn't the first suffering animal she'd come across in Indonesia, and she felt torn between her desire to help and the limitations of what she could do. "There have been many times in my travels where, with a heavy heart and tears of frustration, I've had to leave animals who need help because ... then what?" says Feeney. As luck would have it, Feeney's friend Rebecca had a school in the town - the Bukit Lawang Charitable Trust. "I started to think that I could take her there and she'd have a better chance of survival," says Feeney. 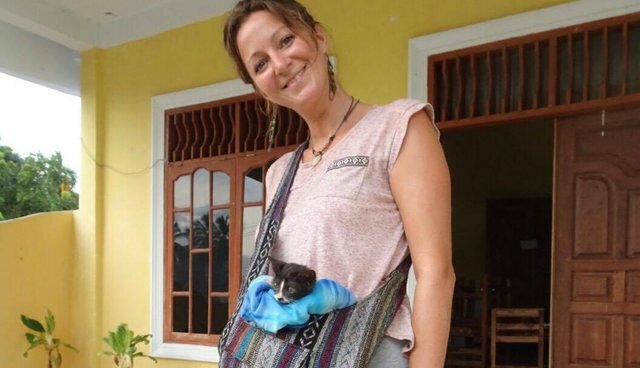 "However I also knew that there are many cats in Bukit Lawang and the school may not appreciate me turning up with a stray kitten, and one that seemed unlikely to survive." As Feeney deliberated, the kitten crawled into Feeney's handbag. She was so little, she fit perfectly. Feeney laughed. The kitten had clearly made her own decision! 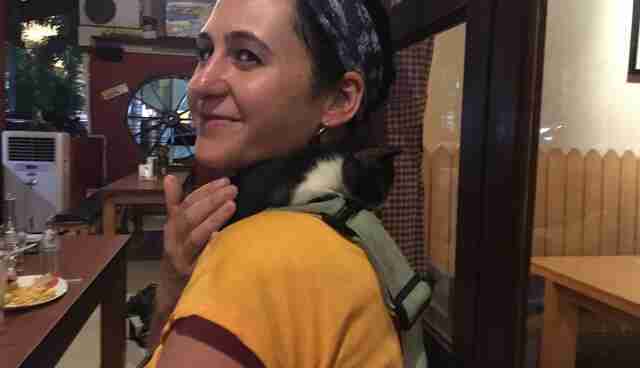 Feeney started taking the kitten (named "Indah," which means "beautiful" in Indonesian) everywhere she went during the rest of her trip. "Indah loves being in the handbag!" says Feeney. "She settles down in it really quickly and has slept away whilst we have been for walks in the jungle, for a swim in the river (her observing obviously), meals in restaurants and the long journeys to and from Medan in order to get her checked out by the vet and get worming tablets." "She's almost like a little joey kangaroo! She genuinely seems to like it in there and I always hold the bag close, like holding a baby, rather than let it bang at my side. 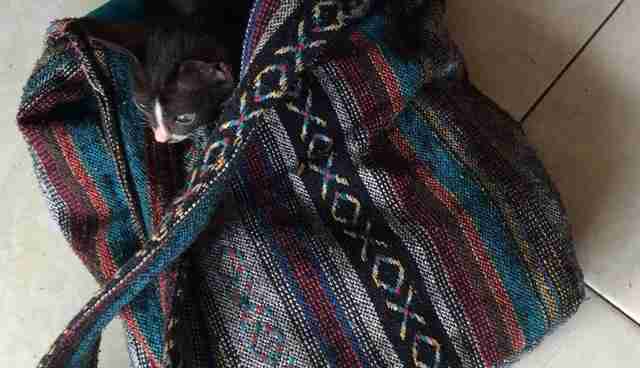 I put a couple of sarongs in there to make it cosy and it gives her a bit of extra height so her head pops out and she rests it in the bag whilst watching the world go by." 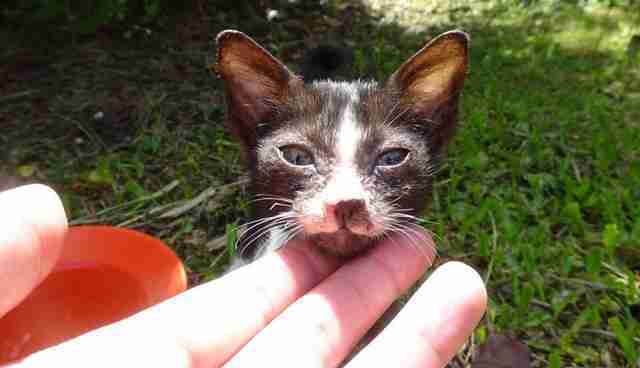 Feeney knew Indah would need ongoing care - she was just too young to survive on her own. So Feeney changed her travel plans. "I had a flight booked to Thailand which I couldn't change so I lost my money on that unfortunately and had to bite the bullet and buy a new one for a later date," she says. "I chose this date as a couple are returning to the school, and they love animals, so it seemed like an appropriate time to 'hand over' the responsibility as I fly to Sydney soon." Still, Feeney worried about leaving Indah in Indonesia. 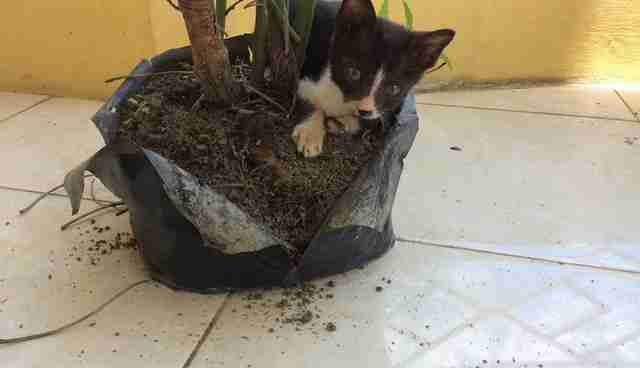 Would the kitten end up on the streets again? Would she get enough food? I met Feeney and Indah myself while I was visiting Bukit Lawang. 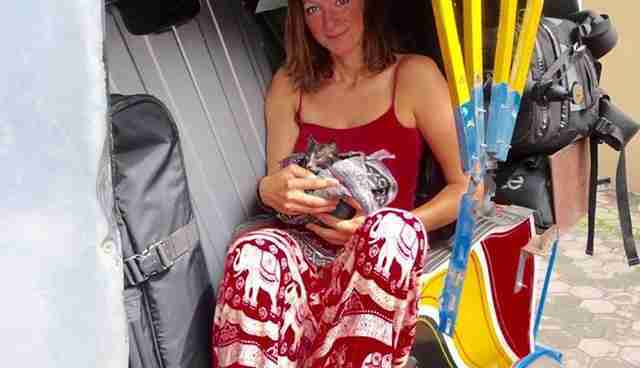 As I heard she had a kitten in her handbag, I begged to hold her. Indah snuggled into my neck, and I fell in love. 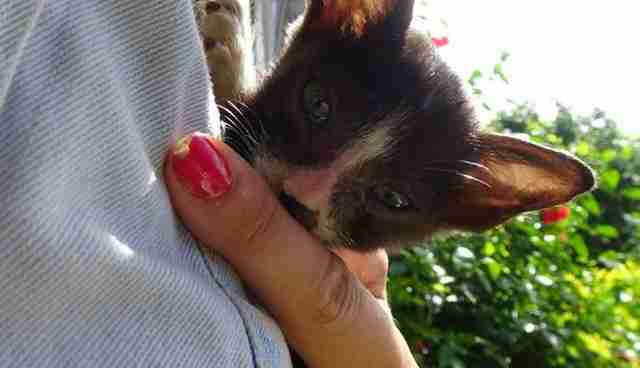 Feeney told me Indah's story, and said she was worried what would happen to the kitten after she left. I offered to adopt Indah if we could fly her over to the U.S. While this decision might seem frivolous, especially as there are plenty of needy cats and dogs back home, both Feeney and I didn't want to limit the compassion we felt for Indah. We also hope that by telling Indah's story, we can inspire others to find ways to ease the suffering of animals in Indonesia. Feeney couldn't be happier about Indah moving to the U.S. "I'm ecstatic to know that she'll have a happy home with Elizabeth," she says. "I would take her myself, but my living circumstances in London, being in rented accommodation, don't allow me to have pets." Before Indah can fly to the U.S., she needs to grow a little older to get vaccinations, and we also need to obtain export permits and raise funds. 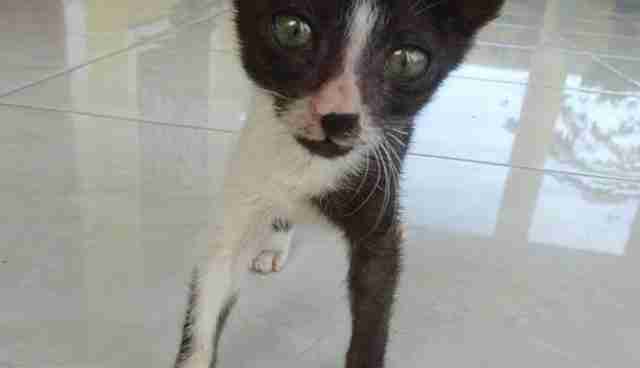 When she finally does arrive, Feeney and I both think Indah will go crazy with excitement to be in a home ... and to meet some American cats! Many Asian cats (including Indah) have short, stumpy tails, so Indah will probably think that long American cat tails are so much fun to chase. While Indah waits, she gets healthier each day. "Initially her eyes were very runny, and would often stick together," says Feeney. "Now they are big, bright and sparkly. Indah has gone from being so wobbly when standing that she would sometimes fall on her side, to running up and down the corridors, chasing imaginary critters." "Even though she is just one kitten, she is a wonderful, spirit-filled animal. Too many times I've had to walk by animals who need help. This time I could do something. Yes, I've missed seeing places, meeting people, experiencing new things, but I have no regrets. At all," Feeney says. To help Indah move to the U.S. to live a life of comfort, security and happiness, you can donate here.